How is it April and where have we been? We've been asking those questions ourselves a lot lately. And well, we can't tell you how it's April already (this year has just flown...), but we can tell you where we've been. We've been busy. And overwhelmed. And stressed. And it looks like this little blog is just gonna need some more time to grow than we had originally planned. And coincidentally enough, it's spring, and spring is a time for growth. It's also a time for spring break, which gives us time to water our little blog, and watch her bloom. Are you still with us after all the flower analogies? If you are, we'd like to show you a Pinterest inspired Bulletin Board Halle found the time to do right before spring break. And she's in looove with it. The idea comes from Dragonflies in First. I love so many things about this bulletin board. The frogs. The bathing suits. The books. I think I mostly love the books. You can find the idea here. Love this blog!!! This was a 2 day project for my class. The first day I handed out a large sheet of green construction paper to each student. I then made 4 tracers each of a frog body and frog head. I have 4 groups of desks, so each student in a group started off with the tracer then passed it on when they were done. (We have been using tracers/supplies like this since the beginning of the year, so they work great with them by now). I had them hold their paper length-wise for tracing. They also cut two strips of paper length-wise, then cut those in half and folded them accordion style for arms and legs. Does that sound confusing? It looks confusing now that I look at it, but again- you're going to be using the templates from Dragonflies in First, so it doesn't matter! Once I approved their frog bodies, they got to pick a square of scrap-book paper for the bathing suits. I didn't have any clear cut instructions or templates for them to follow. Just this wonderful piece of advice, "Just hold up the paper to your frog, and make it fit!" Those had to have been the most vague directions I've ever given to a group of 7 and 8 year olds, and you know what, like 17 out of 20 of them did perfectly fine with those instructions! I only had to help a few! (Note to self: Be much more vague with instructions in the future). And PS, their bathing suits turned out a-feaking-dorable! Loved the one pieces. Also, loved the boys with enough guts to go with speedos over trunks. Too cute! All but a few (those few who had trouble with the bathing suits, even after my clear-cut directions) finished their froggies in about 35 minutes. I told them that the next morning they would be making books for their froggy friends, and that they needed to make their book covers look as realistic as possible. I had pre-printed rectangles and hung mine up as an example, and they were good to go. Love this time of year…they're so much more independent! Their book covers were out of this world, as you can see in these photos! I just was so impressed with their efforts on this project, and I let them know it! They in turn were very proud of themselves. And, they're loving all the teachers poking their heads in our classroom telling us how much they love their bulletin board. I've said previously that I love bulletin boards that aren't particular to a certain holiday because I can keep them up longer. I'll keep this one up till probably mid-May, when I put up our End of the Year board. 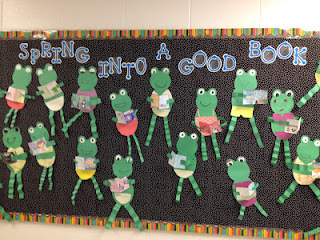 This bulletin board idea is super cute! I love doing these kinds of projects with my class. 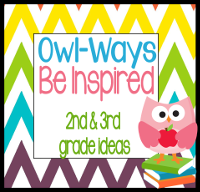 When I first brought one out in the beginning of the year, I quickly learned that I was going to need to do a lot of cutting and gluing projects with them (good thing I love that kind of stuff!). The majority of them really, truly could not cut along a line! And, their gluing skills were....well, let's just say, nonexistent. Long story short, we do lots of this stuff in my room to help with those fine motor, hand eye skills that these kiddos need. Thanks for sharing! P.S. I just became your newest follower! Thanks for stopping by! We're glad to have you!